Spanish naming customs are historical traditions for naming children practised in Spain. According to these customs, a person's name consists of a given name (simple or composite) followed by two family names (surnames). The first surname is usually the father's first surname, and the second the mother's first surname. In recent years, the order of the surnames can be reversed at birth if it is so decided by the parents. Often, the practice is to use one given name and the first surname only, with the full name being used in legal, formal, and documentary matters, or for disambiguation when the first surname is very common (e.g. Federico García Lorca). Currently in Spain, people bear a single or composite given name (nombre) and two surnames (apellidos). The two surnames refer to each of the parental families. Traditionally, a person's first surname is the father's first surname (apellido paterno), and the second one is the mother's first surname (apellido materno). However, gender equality law has allowed surname transposition since 1999, subject to the condition that every sibling must bear the same surname order recorded in the Registro Civil (civil registry), but there have been legal exceptions. From 2013, if the parents of a child are unable to agree on order of surnames, an official decides which is to come first. For example, if a man named Eduardo Fernández Garrido marries a woman named María Dolores Martínez Ruiz and they have a child named José, there are several legal options, but their child would most usually be known as José Fernández Martínez. Each surname can also be composite, the parts usually linked by the conjunction y or e (and), by the preposition de (of) or by a hyphen. For example, a person's name might be Juan Pablo Fernández de Calderón García-Iglesias, consisting of a forename (Juan Pablo), a paternal surname (Fernández de Calderón) and a maternal surname (García-Iglesias). There are times when it is impossible, by inspection of a name, to correctly analyse it. For example, the writer Sebastià Juan Arbó was alphabetised by the Library of Congress for many years under "Arbó", assuming that Sebastiá and Juan were both given names. However, "Juan" was actually his first surname. To resolve questions like this, which typically involve very common names ("Juan" is rarely a surname), one must consult the person involved, or legal documents. A man named José Antonio Gómez Iglesias would normally be addressed as either señor Gómez or señor Gómez Iglesias instead of señor Iglesias, because Gómez is his first surname. Furthermore, Mr. Gómez might be informally addressed as (1) José Antonio, (2) José, (3) Pepe (nickname for José), (4) Antonio (Anthony), or (5) Toño (nickname for Antonio) (6) "Jose" (plain word), (7) "Joselito, Josito, Joselillo, Josico or Joselín" (Diminutives of José), (8) "Antoñito, Tonín or Nono" (Diminutives of Antonio), (9) "Joseán" (Apocopation). Very formally, he could be addressed with an honorific as don José Antonio or don José. Colombian writer Gabriel García Márquez is sometimes incorrectly referred to in English media as Mr. Márquez, when it should be Mr. García Márquez or, simply, Mr. García. It is not unusual, when the first surname is very common, for a person to be referred to casually by his or her second surname. For example, José Luis Rodríguez Zapatero (elected Prime Minister of Spain in the 2004 and 2008 general elections) is often called simply Zapatero, the name he inherited from his mother's family, since Rodríguez is a common surname and may be ambiguous. The same occurs with another former Spanish Socialist leader, Alfredo Pérez Rubalcaba, with the poet and dramatist Federico García Lorca, and with the painter Pablo Ruiz Picasso. As these people's paternal names are very common, they are often called with their maternal names (Rubalcaba, Lorca, Picasso). It would nonetheless be a mistake to index José Luis Rodríguez Zapatero under Z as "Zapatero", or Federico García Lorca under L as "Lorca". Girls are often named María, honouring the Virgin Mary, by appending either a shrine, place, or religious-concept suffix-name to María. In daily life, such women omit the "Mary of the ..." nominal prefix, and use the suffix portion of their composite names as their public, rather than legal, identity. Hence, women with Marian names such as María de los Ángeles (Mary of the Angels), María del Pilar (Mary of the Pillar), and María de la Luz (Mary of the Light), are normally addressed as Ángeles (Angels), Pilar (Pillar), and Luz (Light); however, each might be addressed as María. Also, parents can simply name a girl "María", or "Mari". Nicknames such as Maricarmen for María del Carmen, Marisol for "María (de la) Soledad" ("Our Lady of Solitude", the Virgin Mary), Lola for María de los Dolores ("Our Lady of Sorrows"), Merche for María de las Mercedes ("Our Lady of Mercy"), etc. are often used. It is not unusual for a boy's formal name to include María, preceded by a masculine name, e.g. José María Aznar (Joseph Mary Aznar) or Juan María Vicencio de Ripperdá (John Mary Vicencio de Ripperdá). Equivalently, a girl can be formally named María José (Mary Joseph), e.g. skier María José Rienda, and informally named Marijose, Mariajo, Majo, Ajo, Josefa, Josefina, Fina, Pepa, Pepi, Chepi, Pepita, Marisé or even José in honor of St. Joseph. María as a masculine name is often abbreviated in writing as M. (José M. Aznar), Ma. (José Ma. Aznar), or M.ª (José M.ª Morelos). It is unusual for any names other than the religiously significant María and José to be used in this way except for the name Jesús that is also very common and can be used as "Jesús" or "Jesús Maria" for a boy and "Maria Jesús", and can be abbreviated and "Sus", "Chus" and other. The Registro Civil (Civil Registry) officially records a child's identity as composed of a forename (simple or composite) and the two surnames; however, a child can be religiously baptized with several forenames, e.g. Felipe Juan Froilán de Todos los Santos, but this has no legal significance. Until the 1960s, it was customary to baptize children with three forenames: the first was the main and the only one used by the child; if parents agreed, one of the other two was the name of the day's saint. Nowadays, baptizing with three or more forenames is usually a royal and noble family practice. In Spain, upon marrying, one does not change their surname. In some instances, such as high society meetings, the partner's surname can be added after the person's surnames using the preposition de. One Leocadia Blanco Álvarez, married to a Pedro Pérez Montilla, may be addressed as Leocadia Blanco de Pérez or as Leocadia Blanco Álvarez de Pérez. This format is not used in everyday settings and has no legal value. In chapter V, part 2 of Don Quixote (1605, 1615), Teresa Panza reminds her husband Sancho that, properly, she should be addressed as Teresa Cascajo, by her surname, not her marital surname: "Teresa I was named in baptism, a clean and short name, without additions or embellishments, or dons and doñas; 'Cascajo' was my father; and people call me, as your wife, 'Teresa Panza', though by right I ought to be called Teresa Cascajo ..."
In the generational transmission of surnames, the paternal surname's precedence eventually eliminates the maternal surnames from the family lineage. Contemporary law allows the maternal surname to be given precedence, but most people observe the traditional paternal–maternal surname order. So the daughter and son of Ángela López Sáenz and Tomás Portillo Blanco are usually called Laura Portillo López and Pedro Portillo López, but also could be called Laura López Portillo and Pedro López Portillo. The two surnames of all of a couple's children must be in the same order when recorded in the Registro Civil. Patrilineal surname transmission was not always the norm in Spanish-speaking societies. Prior to the mid-eighteenth century, when the current paternal-maternal surname combination norm was adopted, Hispanophone societies often practised matrilineal surname transmission, giving children the maternal surname, and, occasionally, giving children a grandparent's surname (borne by neither parent) for prestige – being perceived as gentry – and profit, flattering the matriarch or the patriarch in hope of inheriting land. The Spanish naming customs include the orthographic option of conjoining the surnames with the conjunction particle y, or e (both meaning "and") before a name starting with 'I', 'Hi' or 'Y', e.g. José Ortega y Gasset, or Tomás Portillo y Blanco, or Eduardo Dato e Iradier, following an antiquated aristocratic usage. In case of illegitimacy – when the child's father either is unknown or refuses to recognise his son or daughter legally – the child bears both of the mother's surnames, which may be interchanged. Occasionally, a person with a common paternal surname and an uncommon maternal surname becomes widely known by the maternal surname. The artist Pablo Ruiz Picasso, the poet Federico García Lorca, and the politician José Luis Rodríguez Zapatero are examples. With similar effect, the foreign paternal surname of the Uruguayan writer Eduardo Hughes Galeano (his father was British) is usually omitted. (As a boy, however, he occasionally signed his name as Eduardo Gius, using a Hispanicised approximation of the English pronunciation of "Hughes".) Such use of the second last name by itself is colloquial, however, and may not be applied in legal contexts. Also rarely, a person may become widely known by both surnames, with an example being tennis player Arantxa Sánchez Vicario – whereas her older brothers Emilio and Javier, also professional tennis players, are mainly known only by the paternal surname of Sánchez in everyday life, although they also would formally be addressed as Sánchez Vicario. Where Basque and Romance cultures have linguistically long coexisted, the surnames denote the father's name and the (family) house or town/village. Thus the Romance patronymic and the place-name are conjoined with the prepositional particle de ("from"+"provenance"). For example, in the name José Ignacio López de Arriortúa, the composite surname López de Arriortúa is a single surname, despite Arriortúa being the original family-name. This can lead to confusion, because the Spanish López and the Basque Arriortúa are discrete surnames in Spanish and Basque respectively. This pattern was also in use in other Basque districts, but was phased out in most of the Basque-speaking areas and only remained in place across lands of heavy Romance influence, i.e. some central areas of Navarre and most of Álava. To a lesser extent, this pattern has been also present in Castile, where Basque-Castilian bilingualism was common in northern and eastern areas up to the 13th century. In Spanish, the preposition particle de ("of") is used as a conjunction in two surname spelling styles, and to disambiguate a surname. The first style is in patronymic and toponymic spelling formulæ, e.g. Gonzalo Fernández de Córdoba, Pedro López de Ayala, and Vasco Núñez de Balboa, as in many conquistador names. Bearing the de particle does not necessarily denote a noble family, especially in Castile and Alava, the de usually applied to the place-name (town or village) from which the person and his or her ancestors originated; however, in the sixteenth and seventeenth centuries, the usage of de spread as a way of denoting the bearer's noble heritage to avoid the misperception that he or she is either a Jew or a Moor. In that time, many people, regardless of their true origins, used the particle, e.g. Miguel de Cervantes, Lope de Vega, etc. ; moreover, following that fashion a high noble such as Francisco Sandoval Rojas called himself Francisco de Sandoval y Rojas. During the eighteenth century, the Spanish nobility fully embraced the French custom of using de as a nobility identifier, however, commoners also bore the de particle, which made the de usages unclear; thus, nobility was emphasised with the surname's lineage. In the sixteenth century, the Spanish adopted the copulative conjunction y ("and") to distinguish a person's surnames; thus the Andalusian Baroque writer Luis de Góngora y Argote (1561–1627), the Aragonese painter Francisco José de Goya y Lucientes (1746–1828), the Andalusian artist Pablo Diego Ruiz y Picasso (1881–1973), and the Madrilenian liberal philosopher José Ortega y Gasset (1883–1955). In Hispanic America, this spelling convention was common to clergymen (e.g. Salvadoran Bishop Óscar Arnulfo Romero y Galdámez), and sanctioned by the Ley de Registro Civil (Civil Registry Law) of 1870, requiring birth certificates indicating the paternal and maternal surnames conjoined with y – thus, Felipe González y Márquez and José María Aznar y López are the respective true names of the Spanish politicians Felipe González Márquez and José María Aznar López; however, unlike in Catalan, the Spanish usage is infrequent. In the Philippines, y and its associated usage are retained only in formal state documents such as police records, but otherwise dropped in favour of a more American naming order. The conjunction y avoids denominational confusion when the paternal surname might appear to be a (first) name; hence the physiologist Santiago Ramón y Cajal might appear to be named Santiago Ramón (composite) and surnamed Cajal, likewise the jurist Francisco Tomás y Valiente, and the cleric Vicente Enrique y Tarancón. Without the conjunction, the footballer Rafael Martín Vázquez, when referred to by his surnames Martín Vázquez mistakenly appears to be forenamed Martín rather than Rafael, whilst, to his annoyance, the linguist Fernando Lázaro Carreter occasionally was addressed as Don Lázaro, rather than as Don Fernando (Lázaro can be either forename or surname). h. (son of): A man named like his father, might append the lower-case suffix h. (denoting hijo, son) to his surname, thus distinguishing himself, Juan Gómez Marcos, h., from his father, Juan Gómez Marcos; the English analogue is "Jr." (son). 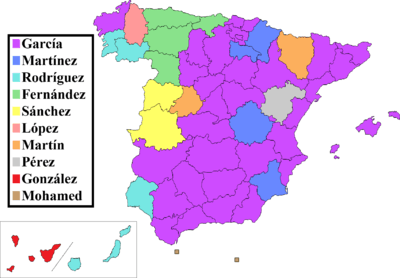 –ez: Spanish surnames ending in -ez originated as patronymics denoting "the son of" – Fernández (son of Fernando), González (son of Gonzalo) – yet not every such surname is patronymic, because in many Spanish dialects the Spanish-language letters z and s are pronounced alike, leading to the same word being spelt with either "s" or "z". In Hispano-American Spanish, the -ez spellings of Chávez, Cortez (Alberto Cortez) and Valdez are not patronymic surnames, because they are variant spellings of the Iberian Spanish spelling with -es, as in the names of Manuel Chaves González, Hernán Cortés and Víctor Valdés. For more on the -z surnames in Spanish see Influences on the Spanish language. Anonymous foundlings were a naming problem for civil registrars, but such anonymous children were often named toponymically, after the town where they were found. Because most foundlings were reared in church orphanages, they were often given the surnames Iglesia or Iglesias (church[es]) and Cruz (cross). Blanco (connoting "blank" here, rather than the more usual "white") was another option. A toponymical first surname might be followed as second surname by Iglesia or Cruz. In Spain, legal and illegal foreign immigrants retain use of their cultural naming customs, yet upon becoming Spanish citizens, they are legally obliged to assume Spanish-style names (a name and two surnames). If the naturalised person is from a one-surname culture, the actual surname is duplicated; therefore, the English name "George Albert Duran" becomes the Spanish name "George Albert Duran Duran", yet the law optionally allows him to adopt his mother's maiden name (her surname), as his maternal (second) surname. Formally, Spanish naming customs conflate his name "George" and his middle-name "Albert" to the composite name "George Albert", and his sole surname, "Duran", is duplicated as his paternal and maternal surnames. The repetition of the mother's surname was also adopted in Chile to give the children of single mothers a double surname to avoid discrimination in school. The Basque-speaking territories (the Basque Autonomous Community and Navarre) usually follow Spanish naming customs. A bilingual Basque-Spanish speaker will not necessarily bear a Basque name, and a monolingual Spanish speaker can use a Basque name or a Basque hypocoristic of an official Spanish name. Some Basque-language names and surnames are foreign transliterations into the Basque tongue, e.g. Ander (English: "Andrew"; Spanish: Andrés), Mikel (English: "Michael"; Spanish: Miguel), or Ane (English: "Anne"; Spanish: Ana). In some cases, the name's original-language denotation is translated to Basque, i.e. Zutoia and Zedarri denote the Spanish Pilar (English: "Pillar"). Moreover, some originally Basque names, such as Xabier and Eneko (English "Xavier" and "Inigo") have been transliterated into Spanish (Javier and Íñigo). Basque surnames usually denote the patronymic house of the bearer; e.g. Etxebarria – "new house", from etxe (house) + barri (new), denotes "related to a so-named farmhouse"; in the same way, Garaikoetxea – "house in the heights", garai ("height") + etxe ("house"). Sometimes, surnames denote not the house itself but a characteristic of the place, e.g. Saratxaga – "willow-place", from saratze ("willow") + -aga ("place of"); Loyola, from loi ("mud") + ola ("iron smithery"); Arriortua – "stone orchard", from harri ("stone") + ortua ("orchard"). Before the 20th century all Basque men were considered nobles (indeed, some Basque surnames, e.g. Irujo or Medoza, were related to some of the oldest Spanish noble families), and many of them used their status to emigrate with privileges to other regions of the Spanish Empire, especially the Americas, due to which some Basque surnames became common to the Spanish-American world; e.g. Mendoza – "cold mountain", from mendi ("mountain" + hotza ("cold"); Salazar – "Old hall", from sala ("hall") + zahar ("old"). Until 1978, Spanish was the single official language of the Spanish civil registries and Basque surnames had to be registered according to the Spanish phonetical rules (for example, the Spanish "ch" sound merges the Basque "ts", "tx", and "tz", and someone whose surname in Standard Basque would be "Krutxaga" would have to write it as "Cruchaga", letter "k" also not being used in Spanish). Although the democratic restoration ended this policy, allowing surnames to be officially changed into their Basque phonology, there still are many people who hold Spanish-written Basque surnames, even in the same family: a father born before 1978 would be surnamed "Echepare" and his children, "Etxepare". This policy even changed the usual pronunciation of some Basque surnames. For instance, in Basque, the letter "z" maintained a sibilant "s"-like sound, while Spanish changed it; thus, a surname such as "Zabala" should be properly read similar to "sabala" (Basque pronunciation: [s̻abala]), although in Spanish, because the "z" denotes a "th" sound ([θ]), it would be read as "Tha-bala" (Spanish pronunciation: [θaˈβala]). However, since the letter "z" exists in Spanish, the registries did not force the Zabalas to transliterate their surname. The Catalan-speaking territories also abide by the Spanish naming customs, yet usually the discrete surnames are joined with the word i ("and"), instead of the Spanish y, and this practice is very common in formal contexts. For example, the current president of the Generalitat de Catalunya (Government of Catalonia) is formally called El Molt Honorable Senyor Carles Puigdemont i Casamajó. Furthermore, the national language policy enumerated in article 19.1 of Law 1/1998 stipulates that "the citizens of Catalonia have the right to use the proper regulation of their Catalan names and surnames and to introduce the conjunction between surnames". The Galician-speaking areas also abide the Spanish naming customs. Main differences are the usage of Galician given names and surnames. Most Galician surnames have their origin in local toponymies, being these either Galician regions (Sanlés < Salnés, Carnota, Bergantiños), towns (Ferrol, Noia), parishes or villages (as Andrade). Just like elsewhere, many surnames were also generated from jobs or professions (Carpinteiro 'carpenter', Cabaleiro 'Knight', Ferreiro 'Smith', Besteiro 'Crossbowman'), physical characteristics (Gago 'Twangy', Tato 'Stutterer', Couceiro 'Tall and thin', Bugallo 'fat', Pardo 'Swarthy'), or origin of the person (Franco and Francés 'French', Portugués 'Portuguese'). Ares (from the name Arias'): Spanish 'Arias'. Carme [f] (Spanish Carmen): Mela, Carmela, Carmucha, Carmuxa. In English the Chicago Manual of Style recommends that Spanish and Hispanophone names are indexed by the family name. When there are two family names, the indexing is done under the father's family name; this would be the first element of the surname if the father's and mother's or husband's family names are joined by a y. Depending upon the person involved, the particle de may be treated as a part of a family name or it may be separated from a family name. The indexing of Hispanophone names differs from that of Portuguese or Lusophone names, where the final element of the name is indexed because the Portuguese custom is to for the father's surname to follow, rather than precede, the mother's. The effect is that the father's surname is the one indexed both for Spanish and Portuguese names. ↑ "Ley 40/1999, de 5 de noviembre, sobre nombre y apellidos y orden de los mismos". Agencia Estatal Boletín Oficial del Estado. 6 Nov 1999. Retrieved 13 Oct 2010. Si la filiación está determinada por ambas líneas, el padre y la madre de común acuerdo podrán decidir el orden de transmisión de su respectivo primer apellido, antes de la inscripción registral. Si no se ejercita esta opción, regirá lo dispuesto en la ley. El orden de apellidos inscrito para el mayor de los hijos regirá en las inscripciones de nacimiento posteriores de sus hermanos del mismo vínculo. If the affiliation is determined by both lines, the father and mother may by agreement determine the order of transmission of its respective first name before registration. If this option is not exercised, the provisions of law shall apply. The order of names registered for the eldest sibling governed the registration in subsequent siblings of the same link. ↑ "Archived copy". Archived from the original on 28 September 2011. Retrieved 2011-07-17. ↑ "Archived copy". Archived from the original on 28 February 2007. Retrieved 2007-02-26. ↑ "Archived copy". Archived from the original on 28 September 2007. Retrieved 2007-02-26. ↑ El Periódico, Una familia puede por fin inscribir a su hijo como Pepe tras dos años de papeleo, 17 April 2007. ↑ "Nombres más frecuentes por provincia de residencia". Ine.es. Retrieved 2016-09-25. ↑ "medbib.com". medbib.com. Retrieved 2016-09-25. ↑ Cervantes Saavedra, Miguel de. Don Quixote. ↑ "Ley 40/1999, de 5 de noviembre, sobre nombre y apellidos y orden de los mismos". Agencia Estatal Boletín Oficial del Estado. 6 Nov 1999. Retrieved 20 Dec 2010. En los supuestos de nacimiento con una sola filiación reconocida, ésta determina los apellidos, pudiendo el progenitor que reconozca su condición de tal determinar, al tiempo de la inscripción, el orden de los apellidos. In those cases where only one affiliation is recognised, it is this affiliation that determines the surnames, being the recognising parent's right to choose, at the moment of inscription, the order of the surnames. ↑ Cardenas y Allende, Francisco de; Escuela de genealogía; Heráldica y Nobiliaria (1984). Apuntes de nobiliaria y nociones de genealogía y heráldica: Primer curso. (2nd ed.). Madrid: Editorial Hidalguía. pp. 205–213. ISBN 978-84-00-05669-8. ↑ Cadenas y Vicent, Vicente de (1976). Heráldica patronímica española y sus patronímicos compuestos: Ensayo heráldico de apellidos originados en los nombres. Madrid: Hidalguía. ISBN 84-00-04279-4. ↑ Article 195, Reglamento del Registro Civil: "On petition of the interested party, before the person in charge of the registry, the particle de shall be placed before the paternal surname that is usually a first name or begins with one." ↑ Penny, Ralph (2002). A history of the Spanish language (2. ed.). Cambridge: Cambridge University Press. p. 16. ISBN 9780521011846. ↑ Moran, Steve. "LINGUIST List 15.1432". The LINGUIST List. Retrieved 13 September 2014. ↑ Coles Smith, Elsdon (2003) . American Surnames (4th ed.). MD, USA: Genealogical Publishing Company. p. 277. ISBN 9780806311500. ↑ "Léxico - Etimologias - Origen De Las Palabras - Expósito". Elalmanaque.com. Retrieved 2016-09-25. ↑ "Archived copy". Archived from the original on 1 April 2012. Retrieved 2012-04-16. ↑ "Archived copy". Archived from the original on 2 December 2008. Retrieved 2009-02-16. ↑ Mariño Paz, Ramón (1998). Historia da lingua galega (2. ed.). Santiago de Compostela: Sotelo Blanco. p. 353. ISBN 84-7824-333-X. ↑ "Institut d'Estudis Catalans: l'acadèmia catalana de les ciències i les humanitats. Portal de coneixement". Iec.cat. Retrieved 2016-09-25. ↑ Vaquero Díaz, María Beatriz (2005). Libro das posesións do Cabido Catedral de Ourense (1453) (in Galician). Universidade de Vigo. pp. 175–208. ISBN 84-8158-291-3. ↑ Feixó Cid, Xosé (2003). Dicionario Galego dos Nomes (in Galician). Xerais. ISBN 84-9782-052-5.